‘IF THIS IS DYING, then I don’t think much of it.’ So said Lytton Strachey on his deathbed, with grave irony. The irony consists in the fact that it did not matter in the slightest what he thought of it; nor could he take it or leave it, death being no respecter of human choice. 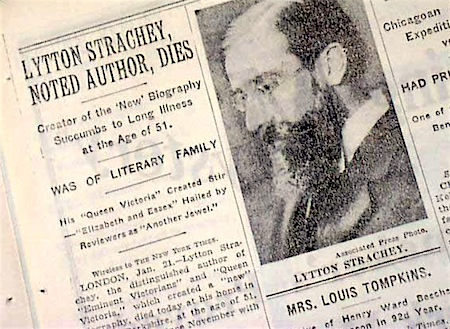 Many years before, Strachey had been equally ironic, once again concerning a matter of life and death. Appearing before a military tribunal which was assessing his claim to be treated as a conscientious objector, he was asked by the chairman what he would do should he see a German soldier attempting to violate his sister. ‘I should try to interpose my body,’ he is said to have replied. The irony of this was not lost on his gay friends, although the outcome might well have been much the same as on the later occasion, since not all German soldiers shared the proclivities of those whom Christopher Isherwood met in the dark streets of the Weimar Republic. Henry James, perceiving the approach of the finale, said: ‘So here it is at last, the distinguished thing.’ The thing might be distinguished but it is also generic and unclassifiable, even for this expert word-user, since as Wittgenstein remarked, death is not an event in life. An ironist is one who detects how loosely we inhabit those meanings and values which (we keep insisting) fit us as tightly as our skin. And I am Marie of Romania. Thus the ever-ironic Dorothy Parker, and her example is a good one. What the ironist says is a matter of logic: if this, then that. But since that is not inevitably that, then this is not inevitably this either. Forgive me pointing it out, my unironised friend, but you are living in cloud-cuckoo land. Which is hardly a solid basis for anyone’s epistemology. And when you find yourself unfriended in heaven, by the interloper’s upwardly mobile cuckoo chicks, you might have to fall a long way on your journey back to earth. The crucifix is a visual emblem of contradiction. How the vertical is crossed by the horizontal. How the body of a man, hoisted high for everyone to see, soon loses its ability to continue. And the Logia of Jeshua seem to be recording a prophet who delighted in turning every old truth inside out. Love your friends? Too easy: love your enemies as well. Someone gives you a belt in the face? Good: now turn the unbruised side of your face around, and let him have a whack at that too. These, in the widest sense, are ironic manoeuvres. But it is possible that the ultimate irony – one that travelled far beyond him, were the words he cried out according to the Gospel of Mark and Matthew: ‘Eli, Eli, lama sabachthani?’ Which is to say, ‘My God, my God, why have you deserted me?’ That power whom Jesus called Abba, or Father, and which had appeared to be an endless source of identity and strength within him, now appeared gone, when he needed it most. If this is an irony, then it is the bitterest one of all. Irony might appear too urbane a word, in a situation of such savage extremity. Or perhaps not. One of Jesus’s most characteristic ironic manoeuvres was to draw attention to the materiality of that which can appear entirely transparent and vehicular: the Law, for example. If you wish to stone to death one you have found morally compromised, perhaps you might examine your own fitness to be the agency of such Law. Or take a look at the coins with which you pay the tribute money. Whose image is embossed upon it? That of Caesar? Then you have already accepted how such coins gain their authority from him, so why not offer them back? This foregrounding of the materiality of the sign is a constant of the ironic mode, often in its most comedic incarnations. When Vincent begs Mia in Tarantino’s Pulp Fiction: ‘If you’re alive, say something,’ she replies, ‘Something’. WE CERTAINLY TALK as though an irony can be created without any particular ironist sitting down to construct it. The ultimate cosmic irony might be this: in the geological era some now call the Anthropocene, since humanity has finally started changing the climate and the structure of the earth itself, Anthropos could find himself annihilated, almost as soon as he has inaugurated a geological era containing his own nomenclature. What goes around comes around. The dinosaurs had no name for themselves until seventy million years after their own extinction, and they were never the ones to utter it. Irony in its verbal form is a distance between this meaning and that one; sometimes the two meanings attach to the one word. So when Mark Antony keeps uttering the word ‘honourable’, in regard to Brutus and the other republican assassins, with each reiteration the word peels itself all the more resolutely away from those men to whom it claims to be attached. Repetition here can be seen to iterate a separation. At times the irony can be contained inside the single word itself, with no further reference to the lexical beyond. Nabokov gives us this little definition of eros: the rose and the sore. Here the word anagrammatizes itself into two hemispheres, one of joy and one of misery. The perception, one suspects, might have been an insomniac one, and Nabokov was a legendary insomniac. The same effect recurs throughout Shakespeare’s Sonnets, though we know nothing regarding that man’s sleeping habits, even if Macbeth’s sleeplessness is the most terrifying evocation of insomnia in the language. In cosmic irony the structure happens to be the structure of everything…And the Freudian irony runs along a parallel line: civilization makes us neurotically ill. In rhetoric it is traditional to distinguish between verbal and structural irony. In the latter some specific event or characterisation is contrasted to the irony of the whole narrative itself, the way the story contradicts itself, or annihilates its own apparent progress by a certain turn of events. In cosmic irony the structure happens to be the structure of everything. So the Darwinian irony is this: only through our expertise in various techniques of savagery, hunting and slaughter, did we manage to create civilization. And the Freudian irony runs along a parallel line: civilization makes us neurotically ill. For each one of us individually, it often seems to be too great a price to pay. But there is no credit relief to be had in the world of the socialised psyche. Like the fly and its legendary amber, we’re stuck with it and in it. In Macbeth the structural irony is the fact that the promises of the Weird Sisters turn out to be lethal equivocations. As the subsequent progress of Macbeth shows, it is not a good idea to base your career (not to mention your eschatology) on a quibble. It is possible that the greatest structural irony in Hamlet is that Claudius is Hamlet’s natural father. The King was, after all, away a great deal, and Gertrude does seem remarkably pleased to be receiving the attentions of her brother-in-law of some decades. She’d had a long enough time to work out whether or not she liked him. So it could be that the Prince, in seeking to avenge his supposed father’s murder, actually brings about his biological father’s death, not to mention his mother’s, Ophelia’s, Polonius’s, and his own. In The Godfather the ultimate moment of structural irony comes at the beginning when Michael announces ‘That’s my family, Kay, it’s not me.’ The rest of the film proves that Michael is his family. All its Sicilian values of vendetta and vengeance are decanted into him. an hour. After all it’s not excessive. Four farts every fifteen minutes. It’s nothing. all, I should never have mentioned it. Such precisions make the human predicament comical, and seem to confirm Bergson’s view that humour frequently occurs when the human appears before us with machine-like motions. Charlie Chaplin in Modern Times achieves this effect supremely when he is swallowed by the machine he is meant to be tending. 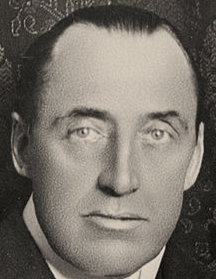 …a choice whose wisdom seemed to be confirmed by history, for, forty years later, a Mr Rathbone Jackson held his grandfather’s office in succession to his father Pankhurst, while the chief posts of the state were held by Messrs Garnett Jackson, Mander Jackson, Huxley Jackson, his uncle and brothers, and by Mrs Athol (née Jackson) his aunt. So strong was the love which the Republic bore the family that General Elections were known as “Jackson Ngomas” wherever and whenever they were held. The author and his style have here become collusive with the corrupt practices which they portray. As the details pile up, the cohesive surface fractures in a formal overload to produce that dissonant effect which is always the endpoint of irony, for irony is the kingdom of dissonance, a dissonance achieved by precision of detail and phrasing, apparently at variance with the overview being propounded. The style holds the content in place just long enough, until the effective content finds itself reversed. Then the first are seen to be last and the last first. We are in that topsy-turvy land where the ironist reckons most of us live anyway. In Black Mischief Waugh satirised an independent African country, Azania. He is often criticised for the implied racism of this novel. What the critics frequently miss is that, if Waugh satirises the Africans, he satirises the Europeans and Americans at least as much. The central source of mischief in the book is the upper-class Englishman, Basil Seal. A Seal, when it emerges from its element, is black. It is Basil, after all, who consumes his casual lover Prudence, in a cannibal feast which appears to be a horrific parody of the Eucharistic meal. The editor of the Catholic weekly, The Tablet, was so appalled by the book that he used his own pages to question publicly whether the new convert really deserved to be a member of the Roman Catholic Church at all. Turn your wisdom on its head, reverse what you imagine to be your immemorial doxa, and see what revelations might then follow. IF, AS HAS often been speculated, the man we call Jesus was known before his death by means of the circulation of the Logia of Yeshua, then his primary trope, the one that drew so much attention to him, would appear to be reversal. If that prophet and healer had one thing in common with Oscar Wilde (apart from the fact of persecution) it was this. Take any well-known saying, particularly one of those in the moral sphere, and turn it on its head. We have, it would appear, so utterly misconstrued the Lord’s intentions as to proceed widdershins, rather than the right way about. Turn your wisdom on its head, reverse what you imagine to be your immemorial doxa, and see what revelations might then follow. You think the poor are the wretched of the earth, but they’re the ones who have first place in the Kingdom of Heaven. You think your possessions are a sign of God’s approval, but if you truly want to do His will, you must give them all away. The possessions you took to be rewards for your virtue are signposts to hell. Wilde’s formulations were often of a similar nature. Take a well-known phrase or saying – for example, ‘Drink is the curse of the working classes’ – and reverse it: ‘Work is the curse of the drinking classes.’ It has a momentary shock effect, a frisson, though if the device is repeated often enough it can become both mechanical and tiresome. As one wag once parodied the procedure: ‘Well, it may not be salt, but it certainly is pepper.’ But in Wilde’s most important works, like the essay ‘The Soul of Man Under Socialism’, the technique is both morally daring, and revelatory. Soon enough it was to lead to his undoing. The technique of taking the least expected route into a subject became such a reflex that Wilde could not control it, even when it offered a danger he might no longer be able to parry. Faced with Edward Carson at his trial, Wilde went for wit when he might have more wisely chosen a less urbane safety. Asked if he had ever kissed the youthful Walter Grainger, he indicated that he had not, and mentioned the young man’s ugliness as a reason. The correct answer would have been that he had certainly not kissed him because he was male. Carson was on to this immediately and saw how the wit, in pursuing his witticism, had betrayed himself in the eyes of the law. Penal servitude followed. Wilde did at least survive in his fashion. Yeshua of Nazareth did not survive his own ordeal, or perhaps he did, if one follows the gospel narratives. The paradoxicality continues: if you wish to be a true son of God, get yourself executed in public as a common criminal. That’s the way to heaven, boys, unlikely as it might seem to you and your Sunday School teacher. SEMANTIC BILOCATION: IRONY insists that meaning is never univocal in modernity (was it ever in antiquity? ), and all situations are overdetermined rather than determined — that is, there is always a manifold of causes, which cannot be ultimately disentangled. When Kafka read a story like ‘Metamorphosis’ to his friends, we are told they could not stop laughing. They seem to have been inhabiting an avenue of irony which has subsequently been closed to us. Or perhaps we are missing the point that the first thing Gregor does in the story is to dream. And when reason sleeps, as Goya told us, it brings forth monsters. The Sermon on the Mount is an essay in irony on an epic scale. If all the reversals of expectation mentioned are to be fulfilled, then…the Kingdom of Heaven is the antithesis of this world. The Sermon on the Mount is an essay in irony on an epic scale. If all the reversals of expectation mentioned are to be fulfilled, then this can only be true if what Yeshua called the Kingdom of Heaven is the antithesis of this world. Blessed are the poor, though they seldom feel particularly blessed here themselves. In truth they can only truly be blessed once they are transposed to the Kingdom. This is presumably by means of death. The forces of law and order here will not be facilitating any promotion into felicity. As Bob Dylan put it: ‘The cops here don’t need you, and man they expect the same.’ They are the forces of law and order, to be sure, but they like to keep both the law and the order all to themselves. You will need to look elsewhere for your own. The silent chorus that the ironist appeals to already knows the worst; it’s been there, seen that. Think for a moment of precisely who that ‘you’ is in Dylan’s line. It is presumed that this ‘you’ will understand, or the song is in vain. Or take for example Thomas Love Peacock in Nightmare Abbey: ‘The lovers were torn asunder, weeping and vowing everlasting constancy; and, in three weeks after this tragical event, the lady was led a smiling bride to the altar, by the Honourable Mr Lackwit; which is neither strange nor new.’ Who is it who finds these reversals, disappointments and rearrangements neither strange nor new? Certainly not the lovers themselves. It is the ancient silent chorus, the ironic gathering at the back of the stage of those that know. What is it that they (or we) know? Everything – but particularly the darker aspects of everything. A certain irony has often been remarked in literary history. Wilfred Owen, that passionate versifier of the horrors of life in the trenches on the Western Front, was killed in action on the fourth of November 1919, precisely one week, almost to the hour, before the Armistice ended hostilities. He was promoted to Lieutenant the day after his death. Is this ironic? Only if Fate is a contriver of structural ironies, who employs biographical material so as to taunt us with reversals and disappointments. Only if Fate is in league with those casual gods whom Gloucester mentions in Lear, the ones who kill us for their sport. Whether the ironist elects himself, or has irony thrust upon him, is perhaps an open question. One thing is not open to question: in the Kingdom of Dissonance, dissonance must be registered precisely or it will issue as mere cacophony. And the ironist could easily insist that his ultimate justification is this: life itself presents us all with an ironic dilemma. We wish to live and are condemned to die. We crave happiness and fulfilment and are denied both. Our instincts must be repressed for the sake of civilization; its discontents are inseparable from its notable achievements. So, as we pine away in our sundry neurotic illnesses, we can hardly help but note the irony of being ‘civilized’. And as we saw, Darwin argued that to get here at all we had to fulfil the requirements of what Coleridge called that ‘blind Ideot called Nature’. Irony here is not a mere stylistic option. It is the expression of an intelligence confronted with injustice, or a cosmic asymmetry cockeyed enough to raise either an eyebrow or a smile. Irony can also be a gesture of stylish exhaustion faced with what Harold Bloom calls our condition of belatedness. As Dylan sings elsewhere: ‘You know it’s all been done before. It’s all been written in the Book.’ And Thomas Mann in Doctor Faustus recounts how one modern composer sold his soul to the devil rather than be for ever entrapped in inescapable repetition. Why do it at all, if it’s all been done before? Why choose a career as a mere stylistic pasticheur? What then would be the price of originality? It must have a moral cost. IF STYLE IS the man, then an analysis of the style should lead us to the heart of the moralist and his matter. Modern physics discovered that nature itself may not be ironic, but it is undoubtedly paradoxical. A particle, viewed from a different angle, is a wave; and a wave, seen differently, is a particle. 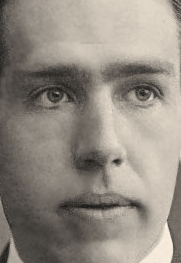 Niels Bohr was the formulator of this notion of complementarity. His own writing is engagingly clumsy, parenthetic, recursive. Every statement implies its own possible refutation. A great truth, he said, is one whose opposite is also true. And this truth is both discovered and enunciated in the morphology of his own style. In an intriguing parallel, the ironist can show us an entire scene in particle mode, then switch lenses and equations, and show us the same scene portrayed as waves. The shift in point of view changes the content, and then what was the same is no longer the same. There is a localised irony, directed towards a specified theatre of engagement. Such irony is confident that there is a larger context which can quell this specific problem. Churchill faced with a mandarin civil servant whose grandeur of expression did not escape pomposity, famously wrote: ‘this is the kind of writing up with which I will not put.’ This is the irony that permits an adjustment that would in turn subsequently obviate the need for the irony. So the irony has now served its purpose, and the civil servant stops despatching his absurd stylistic injunctions. But when Swift writes A Tale of a Tub, the disturbance to be quelled is not local; in fact it begins to seem universal. This is the irony that finds an irremediable dissonance between the expectations of justice and the observation of continuing reality. If that dissonance is comprehensive enough, then it becomes what philosophers call infinitised irony. Evelyn Waugh deployed irony as the necessary distance which the functioning human intelligence had to maintain from any comprehensive scheme of human improvement for the betterment of this world. Sometimes in Wilde the ironic device became a mere reflex action. It could be altogether too happy to remain on the surface. 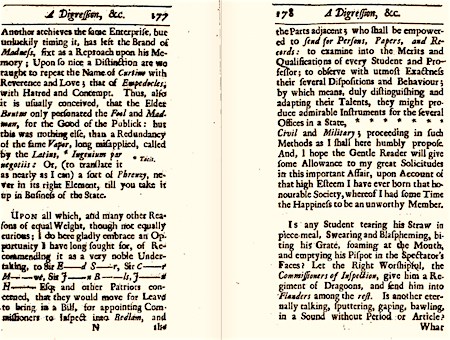 It rearranged the lexical components while leaving the syntax intact: ‘Work is the curse of the drinking classes.’ Thus did the verbal ironies of his trial become the bitter irony of his imprisonment. Evelyn Waugh deployed irony as the necessary distance which the functioning human intelligence had to maintain from any comprehensive scheme of human improvement for the betterment of this world. One had to be careful to distinguish between the possibilities of this world, and those promises to be redeemed in the next. In his greatest work this device permits him the necessary distance from his subject matter that in turn facilitates the ironist’s precision. But it can become a mere affectation, that famous ear-trumpet pointed towards a world he no longer wished to listen to in any case. At the time of the 1959 General Election, Waugh was asked by The Spectator how he might cast his vote. He said he did not presume to advise his Sovereign regarding her choice of ministers. This is an ironic periphrasis signifying: I can’t see the point in voting for any of those fellows, frankly. Here the conjunction of marmoset and maisonette indicates the collision of two worlds. But the matter grows graver. And the disappointed justice with which irony so often tries to parley can overwhelm ironic resource. Faced with the reality of Hitler, the great Viennese ironist Karl Kraus simply said he could find nothing to say. Decades later, Tom Lehrer stopped writing and performing satirical songs. When asked why, he said it was difficult to be amusing about Vesuvius when you were currently living in Pompeii. That was during the presidency of Richard Nixon. Henry Kissinger had just been given the Nobel Peace Prize. Sometimes the ironist cannot keep pace with the realities he faces, let alone outrun them. ZEUGMA IS ONE of the most characteristic tropes of irony, because zeugma enacts a doubleness, a forked effect which produces a dissonance. ‘First you show me your heart, then you show me the door.’ The single verb commands two different linguistic functions. The ironist would say that zeugma is appropriate to the ironic style precisely because of its veracity: it enunciates a truth about our situation, and about that figure of Anthropos, the same egregious figure who used to be described by the church fathers as incurvatus in se, turned back upon himself, doubled-up and self-contradicted. See how swiftly we flick between literal truth and metaphor. Thus does the ironist inhabit an ironic dilemma. Unable to find a domicile in any singular meaning on offer, he is also tormented by that subjective negativity which produces (and is produced by) such semantic and therefore philosophical homelessness. In Schlegel’s terminology, no affirmation is separable from its negation…One wants out of this dilemma, but the exit has been blocked. In Schlegel’s terminology, no affirmation is separable from its negation. And vice versa. The opposite of a great truth is also a truth. One wants out of this dilemma, but the exit has been blocked. Kierkegaard’s leap beckons, as perhaps does Leonard Cohen’s sojourns in certain Buddhist monasteries. Or even a life of action, for those who still have enough vigour left to make that possible. As Marianne Moore puts it: ‘Blessed is the man/who does not sit in the seat of the scoffer/the man who does not denigrate, depreciate, denunciate…’ Perhaps the man who has given up on any of the easier ironies too. Either give it to me straight or keep the gift entirely for yourself. Socrates stays balanced and ironic to the end; his attitude to death seems, in the fullest sense of the word, philosophical. He had reached a fair old age by the standards of his time, and had lived a pretty rackety life. The wine appeared to be inseparable from the dialectics. Maybe he was ready to go. Perhaps he reckoned he had already asked enough questions. Time to let Plato get on with his scribbling for posterity. Would this be an irony? Or what if we were to discover a document that seemed to show, incontrovertibly, that Yeshua at the Last Supper had been asked what was to become of him now. In answer he had taken a piece of bread and said, ‘This is my body’. He had then taken a cup of wine and said, ‘This is my blood’. Then he had consumed both. And they had all understood. Just as he had consumed the bread and wine, so the Roman State would shortly consume him. What has been taken as the institution of the sacrament had in fact been an exercise in instrumental symbolism. Though this still leaves an opening for Emmaus. Once more he breaks the bread and pours the wine, as if to say: that which is consumed may still return, in order to be consumed again. If there is an irony here, it is a little shy in identifying itself. It is noteworthy that two of the greatest ironists who ever lived, Socrates and Yeshua of Nazareth, never seem to have written down a word, except for those fragments of lexis fingered in the dust as the woman taken in adultery was being accused. And those traces were kicked over immediately after. A semantic vagrant then, a philosophical refugee, the ironist may be surrounded by meanings, but he cannot make a permanent home in any of them. He may be pushed into dialectics, and forced to accept that between this meaning and that one lies the shadow, and it inevitably blocks out the sun. He may be pushed into satire, where irony turns savage. He might even take some comfort from Bohr’s Principle of Complementarity: modern physics has established that even nature would appear to be in two minds about itself. Sometimes the ironic scenario as presented to us might seem merely trite, little more than a cheap duplicity, like the tricking of Malvolio in Twelfth Night. Surely we have better things to do than this? And as for cosmic irony, shouldn’t the cosmos have something better to do as well? Is the only difference between impersonal and cosmic irony one of scale? In the meantime the ironic stylist, so long as he does not succumb to the temptation of silence, continues to choose words with the greatest possible care. 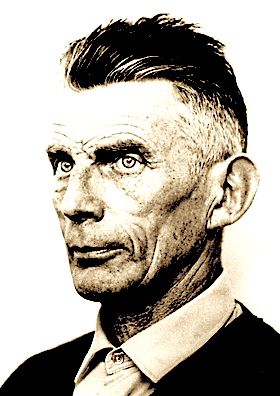 Malone in Beckett’s novel Malone Dies reckons he is close to death, but thinks he might survive Saint John the Baptist’s Day and even the Fourteenth of July. ‘Indeed I would not put it past me to pant on to the Transfiguration, not to speak of the Assumption.’ You have to smile. At the same time we recall Kent’s words at the end of Lear: ‘Is this the promised end?’ The question is of course ironic, and Kent indicates that he himself will not be spending too much longer in this world. So should our ironic dilemmas prove terminal enough, we will not necessarily all die laughing. 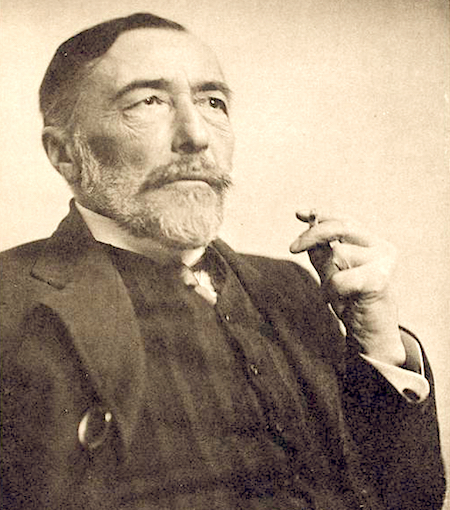 The anonymous reviewer in the TLS in 1907 spoke of Conrad’s ‘friendly irony’ in The Secret Agent. Is it really friendly though, unless the phrase was intended like ‘friendly fire’, a term that would be brought into existence only a decade later in the Great War? The bullets and shells might have grinning faces painted on them, but they tear you to pieces, all the same. There are moments, it is true, where the irony might seem friendly, if still a little grim. Inspector Heat speaks of the anarchists being like fish moving through the sea of London, and when we encounter Comrade Ossipon, we are presumably meant to notice that his name might have started as the French for fish, poisson, before the entropic forces he champions broke the word down into its present curious mangle. His name is orthographically entropic. There is a certain playfulness too when Mr Vladimir asks Verloc what he thinks of ‘having a go at astronomy’. It sounds innocent enough, in its cosmic weirdness, until we realise that what is being discussed is the bombing of the Greenwich Observatory, an explosive device aimed lethally at the First Meridian. This is the whimsicality of the terrorist, and it leads to Stevie’s hideous death. Modern London has provided the ironist with incalculable ironies. Eliot in The Waste Land lamented that the nymphs had departed the Thames. He notes that they have left in their wake the used prophylactics of the privileged children of the City. In comparison the London ironies of Wodehouse seem positively Edenic, the ironic whole being based upon this central structural irony: all the intelligence and knowledge lie with the servant, but the money and possessions remain for ever in the hands of the witless master. 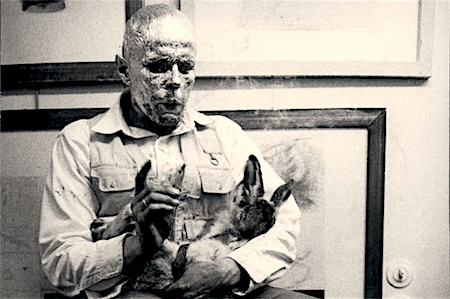 In 1965 in a gallery in Düsseldorf Josef Beuys covered his face with honey and gold leaf and spoke at great length to a dead hare he cradled in his arms. He said that it was much easier to talk to the hare about paintings (even post-mortem) than humans, crippled as they were by their stubborn rationality. This is an irony soaked through with tragedy, and there was something of Lear in Beuys’ enactment. By the time we reach Jeff Koons though, we are in the postmodern culture of the piss-take; which is to say, irony as parody, where all gravities are swallowed with a yawn. His jovial returns upon the theme of carnal love manage to turn the human body itself into a form of kitsch, a multi-coloured confection to be consumed until nausea at last interferes. Here we seem to be in the realm of Bill Baillie’s postmodern vegetarian, who eats meat, but only ironically. But back to that review of 1907. How friendly can irony ever be? It can be urbane, certainly, but urbanity is not necessarily friendly; it is frequently the means of maintaining courtesy in the total absence of any real amity whatsoever. All irony is a form of aggression: the ironist shakes an observed world into defamiliarization, as if it were a snowglobe. Conrad himself in a letter to Cunningham Grahame insisted that there were no ‘malicious intentions’ in his portrayal of the anarchists. One can easily imagine a letter from Swift to Pope insisting that he harboured no ill will towards the Yahoos. All irony is a form of aggression: the ironist shakes an observed world into defamiliarization, as if it were a snowglobe. The fact is that Conrad’s portrayal of the seditious London brotherhood is uniformly negative. There is barely a redeeming feature to be shared out amongst them. And they are all (despite some curious and dubious genealogical claims by Verloc) foreign. Amidst this bunch of nihilistic misfits, sponges and layabouts, there is not a single British heart-of-oak. And that elegant sponsor of murder and mayhem, Mr Vladimir of the Embassy, is undoubtedly Russian. Conrad harboured no sentimentalities regarding Russia or the Russians. But ‘friendly irony’? Verloc himself, double agent between the forces of law and order and those of anarchy, is a biographical exemplum of the entropic principle: he starts in a state of order and moves into disorder: ‘Born of industrious parents for a life of toil, he had embraced indolence from an impulse as profound, as inexplicable and as imperious as the impulse which directs a man’s preference for one particular woman in a given thousand.’ That is entropy in its human form. Knowledge introduces us to entropy. Only ignorance can give us the illusion that the sun will never die; that warmth and light will be our lot for ever. His wife Winnie moves from ignorance to knowledge, and thereby from placidity to murderousness. Knowledge here is an entry into the darkness and cold. Knowledge introduces us to entropy. Only ignorance can give us the illusion that the sun will never die; that warmth and light will be our lot for ever. Her ultimate act in regard to Verloc is to make sure the light outside him is turned off, just as she had so recently turned out the light (however dim) that had shone inside him. Her ultimate act in regard to herself is to depart the light and warmth above the earth for the dark and cold beneath the waves. She throws herself overboard from the cross-Channel steamer. That queer and mangled fish, Ossipon, had helped seal her final despair. But it is poor Stevie who is the truly emblematic figure of human entropy. He is tormented by any form of pain, inflicted either on humans or animals. And his utter devotion to the goodness of his sister’s husband leads to him being blown to pieces by the explosive device he is carrying; he is hoist with his own petard. Led to his death by that Verloc whom he has been raised to revere, he is disintegrated and has to be gathered up with a shovel. But like Humpty Dumpty, no forces – however regal – will ever put him back together again. At the end the Professor is still free to walk the streets with his own explosive device concealed about his person. He is an explosion waiting to happen, a remarkably proleptic portrayal of the modern suicide bomber. All human ingenuity has culminated in this threat to human order and well-being. And this was seven years before humanity started blowing itself to bits on the Western and Eastern Fronts. The structural irony in which the narrative situates itself is that grand construction of (mis)perception whereby the reader – along with Winnie – imagines that Mr Verloc has blown himself to smithereens when in fact he has instead made the arrangements whereby Stevie blows himself to smithereens, thus turning Mrs Verloc, who thought it didn’t do to look too deeply into things, first into a murderer, then a suicide. Conrad’s irony is a recognition of homelessness. To that degree many of the first reviewers were right: this was indeed the vision of an alien, but his alienation had a cosmic perspective. He understood all too well how we mistake one another, and misconstrue our condition here on earth. THE PROBLEM OF usage and implication often arises, as we have seen, when we have an ironic effect without any ironic intention, whether impersonal or cosmic. The use of the word ‘ironic’ then becomes problematical, for how can there be an irony without an ironist? It is ironic, we say, that those people died of thirst and the following day the monsoon arrived. But then where might such irony actually subsist? On what plane? If this really were an irony in the full sense, an intended doubleness of meaning, where one plane of significance occludes the other before offering to reverse it, which agency is deploying the dual meaning? From whence is our bifocal epistemology originating? If, like Gloucester, we can say ‘As flies to wanton boys are we to the gods/They kill us for their sport’ then the irony can indeed be a full one: here is a lethal jokiness of fate for us to savour, even as it is being inflicted upon us. It is our misery which makes the gods smile. Or if like Jacques in As You Like It we can assert that ‘All the world’s a stage’, then this image of the theatrum mundi can provide us with a framework of fateful display in which all ironic effects can ultimately be sourced as ironic intentions. But without such a theatrical cosmology, we appear to be dealing with coincidences which produce ironic effects, but with no ironic intentions to motivate or dislocate them. Our use of the word ‘ironic’ then produces ironies in its turn; ironies of disconnection between a perceived effect and the dislocation from any meaningful causality that might have preceded it. This is an irony born entirely of contingency, and as such it has been severed from any rhetorical roots. It wasn’t ironic that the monsoon arrived the next day; it was simply bad luck that it did not come a day earlier. 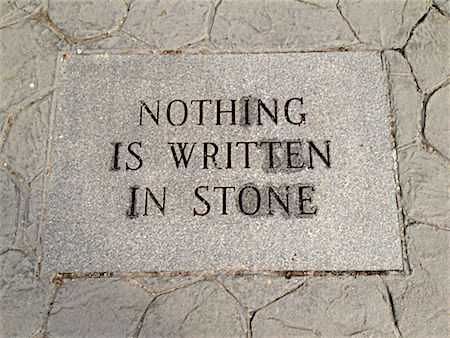 If it were a genuine irony, then we humans would be more significant in the scheme of things than we really are. To report these matters truthfully, we need to be anti-ironic, as were many of the early stories of Ernest Hemingway, and much of the poetry of Hardy. To allow irony a place here is to delude ourselves that we have a more significant position in the ultimate scheme of creation than we in fact do. Take a single example. In the University of Birmingham Library there is a curious item. It is a badly charred Bible. It is thought that this was the Bible from which Joseph Priestley read in the Unitarian meeting house he frequented in that city. The reason it is so badly burnt is that it found itself at the centre of the Church-and-King Riots in 1791. 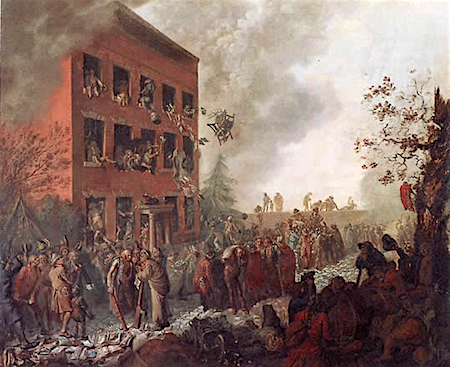 These same riots and their keenly patriotic rioters destroyed Priestley’s laboratory, one of the finest in Europe at the time. Now Priestley was the discoverer of oxygen as a separate element in these islands (others were simultaneously discovering that same elementary singularity elsewhere), and he was a lifelong student of the processes of fire. If we say that the authentic stink of burning which still emits from that damaged piece of holy writ embodies an irony, given the nature of Priestley’s chemical studies, then we are in effect saying that Clio, the goddess of history, must be deemed a zealous ironist in her own right. If we are not saying this, then we must presumably imply that irony can be solely a matter of effect, with no manner of intention anywhere in sight. No theatrum mundi, no playful gods smiling at human misery, no double-dealing Clio, merely a compound dissonance, a random effect, which elicits an ironic response in us. So the dissonance perceived lies not so much in the materia presented, which is merely discrete and coincidental, as in our concerted response to it. The irony lies in how we would have contrived matters differently, had the contrivance been in fact at our disposal. Such irony is not so much objective then, as voulu. THE CHARACTERISTIC TEXTUAL manoeuvre of irony is for the words on the page to trip themselves up, then catch themselves sufficiently quickly that the meaning does not fall over so much as foreground itself, often in front of its own mirror image. The eiron stares across the stage at the alazon; understatement looks overstatement in the eye, and winks at the audience. The footnote can be the perfect means to this end, since the extended foot actually obtrudes itself at the bottom of the page, and the page can be seen to take a bit of a tumble over it. Pages can of course argue with themselves (and within themselves) in different ways. In the dialogue poems of Marvell and Yeats, the quarrel is conducted relatively straightforwardly. This feels like an overt pugilistic contest, employing Marquess of Queensberry Rules, but there is something sneaky about the footnote. Often enough it does what the dwarves used to do at court: play the fool, extemporize the role of the licensed jester. Gibbon’s footnotes in Decline and Fall permit him to be even more acidulous and rib-poking than he already is in the text. If you were an early Christian or theologian of note, you would not wish to be memorialized thus, buried in one of these neat little typographic coffins. But still in Gibbon the textual footnote is playing the straight man to itself. Something different had happened with Swift and Pope. In A Tale of A Tub and The Dunciad, the footnote signs its own declaration of unilateral independence. In those works, the footnote is a space of riot and misrule. These notes are trapdoors in the textual stage through which you can fall, and there is no guarantee you will ever stop in your descent, since such footnotes provide a space for that infinitized irony that so alarms philosophers. It might have had its birth in Schlegel’s exposition of irony, where the opposite must always be embraced. Certain words contain their own antonyms. Freud was fascinated by these, giving cleave as an example. We cleave in two, but we also cleave unto. This idea also finds a locus in Empson’s seventh type of ambiguity, where opposites are held together, like cathodes and anodes, sharing the electric current between them. (Niels Bohr, we remember, after his study of wave/particle complementarity, believed that all great truths contained their opposites. In 1900 to say a particle might be a wave, or a wave become particulate, would have been a paradox, perhaps even an irony. After the Solvay Conference of 1927, it became the statement of a scientific fact.) We seem to end up inhabiting an irony so large it starts to appear inescapable, and sometimes even invisible; an irony without any unironized exterior peg by which it might ultimately secure itself. And so we move on through Borges, whose footnotes provide exquisite points of scholarly reference, frequently quoting texts that only ever existed as facets of the author’s invention. Or there is Nabokov’s Pale Fire, where the notes so bully the text they are claiming to gloss and elucidate that there is in effect an undeclared war between primary text and pendant annotation. Finally we arrive at David Foster Wallace, for whom the footnote was a further site of alienation and paranoia, a mirror world of disputation and distortion, with no respite. Alan Wall was born in Bradford, studied English at Oxford, and lives in North Wales. He has published six novels and three collections of poetry, including Doctor Placebo. Jacob, a book written in verse and prose, was shortlisted for the Hawthornden Prize. His work has been translated into ten languages. He has published essays and reviews in many different periodicals including the Guardian, Spectator, The Times, Jewish Quarterly, Leonardo, PN Review, London Magazine, The Reader and Agenda. He was Royal Literary Fund Fellow in Writing at Warwick University and Liverpool John Moores and is currently Professor of Writing and Literature at the University of Chester and a contributing editor of The Fortnightly Review. His book Endtimes was published by Shearsman Books in 2013, and Badmouth, a novel, was published by Harbour Books in 2014. A collection of his essays has now been issued by Odd Volumes, The Fortnightly Review’s publishing imprint, and a second collection, of his Fortnightly essays on Walter Benjamin, is in preparation. An archive of Alan Wall’s Fortnightly work is here. Note: This essay was updated on 8 August 2016 to correct an editing error. This Fortnightly Review article is filed under the following rubrics: Commentary on Art and Literature. Publication: Saturday, 6 August 2016, at 09:27. Options: Archive for Alan Wall. Bookmark the permalink. Follow comments here with the RSS feed. Post a comment or leave a trackback.